Poor Annika Bengtzon. She’s one of my favourite characters in crime fiction. There’s something compelling about her inability to keep her emotions in check and her disastrous love life has the capacity to keep readers entertained for many more books to come. In The Long Shadow, many of the elements that we’ve come to love from Marklund’s series are here but the change in location, from Sweden to the Costa del Sol in Spain, gives the book a welcome freshness. A Swedish entrepreneur with a history of dodgy business deals is murdered with the rest of his family in Spain. Information coming through from the Spanish police is scant and Annika is sent by her newspaper to report on the case. Accompanied by an glamorous local interpreter, she soon discovers that one of the family’s teenage children is missing. Annika sets out to track down the teenager but the affluent expat lifestyle hides sinister feuds that stretch from Colombia to Sweden. Annika also finds old cases are connected to the present and, predictably, her love life is once more a complicated tangle. The Long Shadow has many of the motifs of previous Marklund books. We have a complicated and interweaving narrative involving a murder with political overtones. This is set to the backdrop of Annika’s professional life working on a busy newspaper which is struggling to maintain its circulation figures and her usual domestic turmoil. 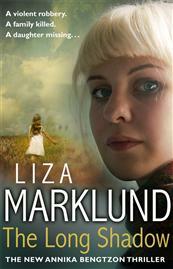 Marklund has created a character with plenty of depth: someone who despairs at her turbulent domestic situation but recognises her own weaknesses and is immersed in her job which, in effect, comes before anything else. The Spanish setting works well and we enter the world of Swedish expatriate life. One amusing note is the anti-English element expressed by one expat in particular who bemoans the golf playing, wine swilling life enjoyed by many elderly British residents. 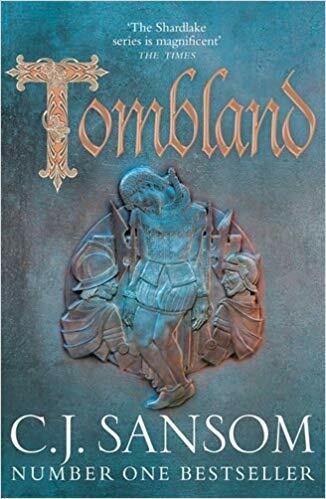 This book is up with Marklund’s best and it could easily be read as a standalone by those unfamiliar with the series. I’m not sure I like the direction that Annika’s life is taking at the end of the novel but hopefully Marklund has something up her sleeve. Thanks to Transworld for sending me the novel. The translation was by Neil Smith. oh I’ve missed this somehow. Must track it down, though i still have some back-catalogue to read. Thanks Mary. I think this one of the better ones. Sarah – Terrific review as ever. I’m so glad this lives up to expectations. Of course, I like Liza Marklund’s work very much, so I’m biased. I haven’t yet had the chance to read this, and now I’m even more excited for it. By the way, I notice you’re reading the next Horst. I hope you’re enjoying it and I’ll look forward to your review. Thanks Margot. Yes i’ve just finished the latest Horst. Slightly different from the last one but still enjoyable. Review coming soon…..
To be honest, I read this without having read the previous ones and found I hadn’t a clue what was going on most of the time, and still didn’t at the end. While I liked Annika as a character and enjoyed the writing, it’s put me off reading any of the others, since it’s one of the very few crime novels I’ve read where a knowledge of previous books was essential. That’s interesting. I think because the plot was so enjoyable that I thought it would work well as a standalone. But it’s interesting to get another view from someone who hasn’t read earlier books. Thanks. An interesting mix of opinions. That this could be read as a standalone and Fictionfan thinking otherwise. I do like series fiction and if I read them I prefer to read them from the start. The reason I like them is precisely because of the continuing personal narrative, but it does become difficult to make each novel stand alone. I haven’t read any Marklund. I shall look her up. Thanks. Thanks Rebecca. I like series too but prefer not to be bound by any particular order. I’ve read this series out of sequence and it’s worked well for me but given Annika’s complicated life perhaps it is best read in order. Even those who are relaxed about reading series out of sequence would be well advised to read Lifetime before Long Shadow. It is very much a follow on, and explains many key elements of the previous book. Thanks Philip. I couldn’t remember much of Lifetime when I read this one but I’m sure my knowledge of the plot helped. I am never going to catch up with your encyclopaedic knowledge of Scandi-crime! But I do always enjoy reading your reviews and making notes of different series and where I should start with them…. Good to know that this is a good one. I started with Red Wolf, which was fine with me and I didn’t mind that I’d missed the earlier books. Then I read Last Will, which was okay. I’m waiting for the library to get the next two books, and I’ll try to read Lifetime before Long Shadow, based on recommendation above. I like Annika’s character, quirky, interesting, unexpected. Never boring or predictable, which is good in crime fiction, where are so many cookie-cutter series and characters. She’s a one of a kind, and pretty brave, too. I dig right into these books and keep going until the last page is turned. I love Annika’s character too Kathy. It’s always a pleasure to pick up one of Marklund’s books. Whenever I read a review of this series, it does not really appeal to me. But so many readers like it so I am definitely going to try it someday. And coming in so late, I will aim at reading in order if possible. Thanks Tracy. I’d love to hear what you think. Thanks for the great review. I too like the Bengtzon character as she is more normal than some. In that normal is chaotic and crazy sometimes. I will be adding this to my “To be read” list. Hi – thanks for stopping by and commenting. Glad you like Annika Bengtzon too!